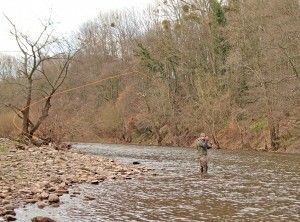 Fly Fishing can be a graceful and elegant sport and a great way to spend your time. I remember as a child watching the demonstrations at local Game Fairs and Fly Fishing events, as the demonstrators would cast to the horizon and carve shapes in the air, I couldn’t wait to go fishing to try out what I had learnt. But soon I realised those demonstrators were professional guides and gillies and they spend all day every day at the riverside. Spending time with a qualified instructor is the easiest way of learning the sport and becoming a proficient caster. Watching DVD’s and reading books can be very helpful, but there is no substitute for having an instructor on your shoulder to show you how to use your equipment efficiently and correct any faults you may have as they occur. Practicing faults can build up muscle memory which can be difficult to break. 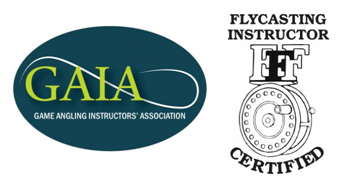 I have been assessed at the highest level in two organisations the FFF (Federation Fly Fishing) and GAIA (Game Angling Instructors Association). Within GAIA I hold the APGAI (Advanced Professional Game Angling Instructor) Qualification in both Trout and Salmon disciplines. Within the FFF I have been accessed internationally and I am the first in Wales to hold both MCI (Master Casting Instructor) and THCI (Two Handed Casting Instructor). Whether you are taking your first steps, an experienced angler looking to improve or would like to become instructor yourself I will be able to help.